The 2014 model year marks the debut of what is surely one of the most significant new models to be launched by Yamaha in recent years. As well as representing the beginning of a new direction in sport bike evolution, this new machine represents the re-ignition of those forces that shaped the first generation MT models. 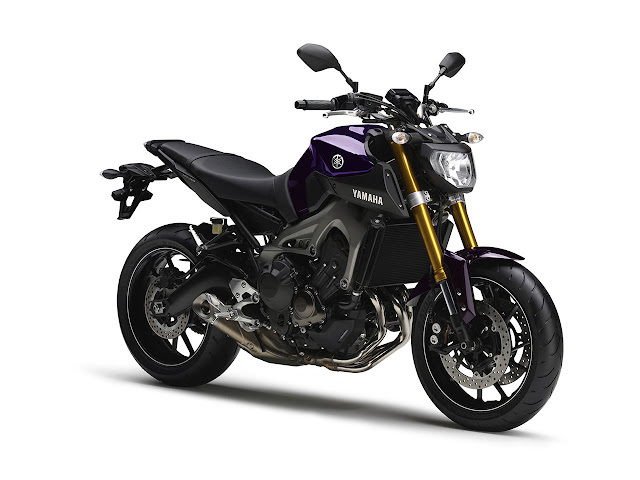 With its strong focus on heightened riding emotion, multi-faceted character, naked mass-forward style and outstanding all-round agility, this motorcycle takes Yamaha into new territory. Created by the same team of engineers that changed the face of the supersport world with the original R1, the all-new MT-09 is ready to challenge the status quo and bring a new kind of performance, together with increased riding emotion and provocative new-wave design to the street. Ask a selection of riders what Yamaha means to them and you’ll get many different answers. Older riders will tell you Yamaha means high-performance 2-stroke twins. Trail riders will say XT or Ténéré. And supersport fans will surely regard the R-series as the bikes that define Yamaha. Of course, they are all right. Because Yamaha means different things to different people. But there is another word that will always be associated with Yamaha. That word is passion. We build motorcycles because we are motorcyclists. We are totally committed to the two-wheeled world. Just take a look at some of the models we have built over the years and it is clear that they are more than machines. They embody the very soul of the designers and engineers that created them. Only Yamaha could have produced bikes like the XT500, RD350, Ténéré, VMAX and R1. And only Yamaha could be the driving force behind the new MT-09. Since we built our first motorcycle, the two-wheeled world has changed beyond recognition. Rapidly advancing technology has brought previously unattainable levels of engine and chassis performance to the street. The new Yamaha MT-09 represents the next step in sport bike development. Light, powerful and delivering thrilling performance in everyday conditions, the MT-09 is ready to bring an exciting and addictive new dimension to sport riding. This 850cc 3-cylinder naked motard-style design is a new kind of animal in the two-wheeled jungle that combines strength with guile. Above all else, the MT-09 is about emotion, character, excitement, agility and control. Its surge of raw, linear torque is available instantly throughout the rev range for adrenaline-charged acceleration. At the same time as having a wave of characterful torque waiting to be unleashed, this revolutionary new 3-cylinder bike also pushes out serious quantities of class-leading horsepower to give the MT-09 a leading power-to-weight ratio in the upper mid class. Weighing in at less than a Yamaha YZF-R6, this light, powerful and agile motorcycle will prove to be a revelation to those riders brought up on more conventional designs. Building on the charismatic mass-forward look pioneered by the original MT models, its lightweight naked body shows off the compact engine and focuses attention on the muscular motard look that emphasizes the bike’s dynamic image. The arrival of the MT-09 marks more than just a new chapter in Yamaha’s evolution. This new-wave 3-cylinder naked motard offers an exciting new alternative for those riders who understand what the shape of a torque curve means. And sport riding is never going to be the same again. While some onlookers may see Japan as a traditional and respectful society where conformity is the norm, behind this stereotypical image lies a vibrant sub-culture where new fashions and ideas are constantly emerging. From the spectacle of drift racing through to the insanity of Japanese speedway, the other side of Japanese society has been responsible for some wild and wonderful trends. The same creative forces that drive the darker and unconventional side of Japan have inspired and shaped the unique and original MT-09, which is about to change the sport motorcycle world. Raw torque. Motard control. Naked soulbeat. A new excitement. 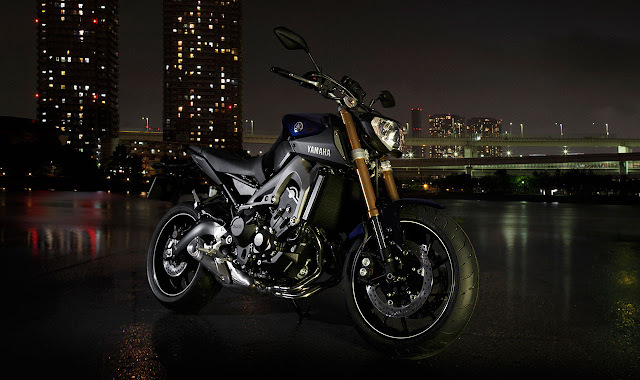 MT-09 is much more than a next generation sport bike. This game-changing machine represents a whole new direction for Yamaha. With a focus on strong torque delivery, agile handling and total controllability, this all-new 3-cylinder motorcycle is built to deliver exciting and enjoyable motorcycling. Yamaha now believe that it's time to offer European riders the opportunity to experience a compact high-torque mid-class sport machine that is designed to bring new levels of engine and chassis performance to the street. The company’s decision to diversify into the 3-cylinder class reflects the fact that very many of today’s sport riders place a great emphasis on engine character and everyday driveability. While there will always be a place in the market for high-powered 4-cylinder motorcycles, Yamaha believe that the 3-cylinder layout used in the new MT-09 opens up a new world of possibilities. By combining the best characteristics of both the 4-cylinder engine and the parallel twin, the new lightweight Yamaha 3-cylinder unit offers a new and exciting riding experience to those customers who may be either moving up from the 600cc class, or down from the one-litre class. Producing class leading torque and high levels of horsepower, together with a throaty exhaust note, this easy-handling mid-class motorcycle takes the sport category into new territory. Without a doubt the most significant feature on the new MT-09 is its all-new 3-cylinder engine, which is the key element that shapes the fundamental character and feel of this new mid-class sport bike. The goals during the intensive development programme were to create a compact and lightweight 3-cylinder engine producing a raw but linear torque output together with strong high rpm power. Attention was also focused closely on achieving a satisfying intake and exhaust note, as well as creating a visually attractive powerplant that would enhance pride of ownership. Furthermore, the MT-09 development team also placed great emphasis on achieving high levels of economy together with good environmental performance. Featuring a bore and stroke of 78mm x 59.1mm to give a displacement of 847cc, this all-new 4-stroke DOHC 4-valve engine runs with a compression ratio of 11.5:1. Intake valve diameter is 31mm, while exhaust valve diameter is 25mm, and by setting the valves at a narrow angle of only 26.5 degrees, our engineers have been able to keep the combustion chambers ultra-compact for quicker combustion processes and higher torque output. The MT-09’s all-new 3-cylinder engine has been developed to embody the essence of Yamaha’s ‘crossplane philosophy’ which is designed to ensure instant throttle response together with strong low to mid-range torque. One of the inherent characteristics of the 3-cylinder engine design is its linear torque output, and it is this strong and responsive power delivery that defines the fundamental character of the new MT-09. The all-new engine runs with a 120º crank that delivers a regularly-spaced firing sequence at 0º, 240º and 480º, and it is these even firing intervals that ensure a linear delivery of the massive levels of available torque, together with an exciting and satisfying high rpm power feeling. Compared to an in-line 4-cylinder engine with a 180º crank, the MT-09’s 3-cylinder powerplant transmits a stronger feeling of combustion torque to the rider because its combustion torque waves and composite torque waves are virtually identical. The MT-09’s 3-cylinder design is also inherently lighter, slimmer and more compact when compared to parallel 4-cylinder designs, being around 10kg less than the Yamaha FZ8. This has given our designers greater freedom to produce a correspondingly compact and agile-handling sports chassis. Overall engine width has also been minimized by pressure inserting the gears on the crank web, a process which allows the space between the cylinders to be reduced. To minimize unwanted vibration while still allowing MT-09 riders to enjoy the engine’s strong power pulses, the powerplant is equipped with a primary coupled-force counter rotating balancer. In order to maximize the potential of the engine’s linear torque output, Yamaha’s engineers have developed an all-new transmission which is specifically designed to match the unique engine character of the MT-09. To handle the wave of low to mid-range torque, the MT-09 runs with a relatively high primary reduction ratio of 1.708 (FZ8 = 1.512), and both the secondary reduction ratio and also the ratios of the 6 gears are also set to optimize the bike’s driveability in everyday riding conditions. The new transmission complements both the engine’s instantaneous throttle response as well as its strong low to mid-range torque, to give rapid acceleration and a sporty and exciting riding experience. The Fuel Injection (FI) system features twelve-hole injectors which are designed to deliver an atomized fuel spray with a droplet size of only a few microns. These injectors are attached directly to the 4-valve cylinder head, a design which ensures the highly precise injection of fuel directly at the valve skirt to give good fuel efficiency. An added advantage of positioning the injectors directly onto the head is that it allows the use of shorter throttle bodies which contribute towards achieving high rpm intake efficiency. Another significant aspect of the fuel system is the use of a compact and lightweight fuel pump, which allows the use of a slim 14-litre fuel tank. With its efficient fuel injection system and YCC-T, the MT-09 offers a potential range from the 14-litre tank of 240km or more depending on the conditions. Another feature which is designed to enhance the engine’s strong torque characteristics is the downdraft intake system which utilizes three intake funnels of unequal length. The first funnel is 102.8mm long, the second is 82.8mm and the third is 122.8mm, and these different intake passage lengths create slightly different conditions in each cylinder head to create complementary power and torque curves. Combined with the highly efficient torque-boosting YCC-T system, these intake funnels help to make the MT-09 such a versatile and enjoyable motorcycle which feels at home whether commuting to work in the week or going for a Sunday morning run on twisty country roads. There’s also the added bonus that these unequal length funnels also make a gutsy intake sound which, together with the exhaust system, gives the MT-09 a unique and sensual sound. Yamaha’s engineers set out to build a motorcycle that would deliver instant engine response in order to achieve high levels of rider/machine unity. One of the major factors in being able to achieve this level of controllability is the use of a Yamaha Chip Controlled Throttle (YCC-T) which is derived from our YZF-R series supersport models. This ‘fly-by-wire’ system senses every throttle action made by the rider, and the ECU instantaneously actuates the throttle valve to give an immediate engine response. Such is the speed of this chip controlled system that it gives the feeling that the MT-09’s engine is an extension of the rider's right wrist that can be controlled at will, giving added riding confidence – particularly when instant acceleration is required. In order to enable the rider to optimize the performance characteristics of the new high-torque 3-cylinder engine, the MT-09 runs with an all-new compact and lightweight aluminium chassis. The space-saving and weight-reducing features employed on the new engine have given our designers great freedom in the design of the frame. Its structure consists of CF aluminium die-cast left and right halves which, like the MT-01 frame, are bolted together at the head pipe and rear pivot areas. Compared to a 4-cylinder model in the same capacity class - such as the FZ8 - the MT-09 achieves overall weight savings of around 10kg in the engine and a further 10kg in the chassis, making it one of the lightest sport bikes in the 700cc+ class at only 188kg wet. One of the key goals in the MT-09 development project was to create a machine that gives the rider increased levels of pleasure and enjoyment by being able to control the machine at will. More than any other form of transport, a well-designed motorcycle should feel like an extension of the body. By carefully selecting such dimensions as the wheelbase, seat height, caster angle and overall riding position, Yamaha’s designers have been able to produce a compact and easy handling chassis which responds accurately to every rider input. The MT-09’s natural handling qualities are also enhanced by the efforts to centralize mass with the use of a low-level under-slung muffler, and an almost horizontal rear shock absorber. As well as their positive effects on handling performance, the location of these major components also contributes towards the MT-09’s slim and compact body design. The swingarm is a CF aluminium die-cast design with the left and right sides welded together with extruded aluminium cross members, and this design gives the desired rigidity balance and minimizes unsprung weight for responsive and comfortable suspension action. In order to achieve our goal of building a compact chassis, the swingarm’s pivot assembly is located on the outside of the frame in a system similar to that used on the MT-01. This reduces the chassis width in the footrest area to that of a typical parallel twin cylinder machine, and gives a slimmer and more agile feel to the whole motorcycle. The MT-09 is equipped with newly-designed upside down front forks which are equipped with flex-resistant 41mm tubes that deliver progressive and plush suspension characteristics. These new forks offer 137mm of wheel travel – 7mm more than the FZ8 – to give high levels of riding comfort and responsive steering on a variety of road surfaces from cobblestones through to fast twisties. A cast aluminium handlebar crown and forged aluminium lower triple clamp help to minimize the MT-09’s weight, and the new front forks can be adjusted for rebound damping. At the rear the MT-09 runs with an innovative new link-type Monocross suspension design which incorporates an almost horizontal shock positioned beneath the seat. The location of the shock not only contributes towards the bike’s centralization of mass which helps to enhance handling – it also makes for a slimmer chassis layout, and the under-seat location protects the shock and linkage from the road dirt to help reduced wear and tear. Featuring rebound damping and preload adjustment, this rear suspension can be fine-tuned to suit a range of riding conditions and preferences.